Have you hit the goals you planned or have you let them slipped away like you did last year and the year before that? 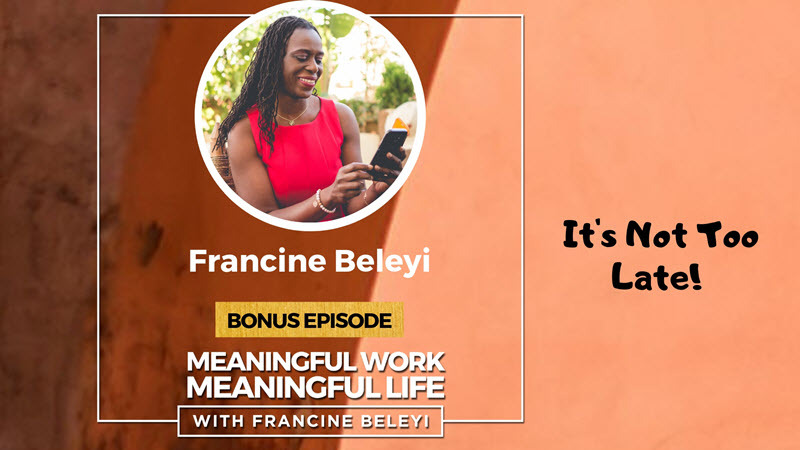 Welcome to the Bonus episode of the season 1 of Meaningful Work, Meaningful Life podcast, the show that empower you to redefine the life you want and live your best life now! Andrew Priestley (ep 13) talked about the 3 things that need to occur to achieve meaning: you’ve got to love what you do; you’ve got to actually be good at it and find where can you achieve the most value. Jazz Rasool (ep 10) shared 3 core things that need to happen to bring you life: what you’re passionate about, what you’re talented in and what you have a sense of responsibility or duty for. If those 3 conditions are not there, you will struggle to make it. Today’s episode is about uncovering some insights from the past three months not just for me with this podcast, but I’d like you to take this opportunity also to reflect. You started this year with some goals that you wanted to achieve…Perhaps you wanted to have more meaning in your work, do something that matters to you. Or you started the year with the desire to increase your income, save more money or make a significant investment. Or maybe you said, you know what? I am ready to make a difference in the world and would like to become a recognised thought leader in my field and create a movement with a cause that I am so passionate about. Whatever it was, where are you now? The first 3 months of the year are now behind us; it’s time to do a reality check. What have you been able to achieve this past quarter? Have you hit the goals you planned or have you let them slipped away like you did last year and the year before that? Take an honest look based on what you thought you’ll achieve this year and check where you are at? The good news is that there are 3 more quarters left and a lot can be done during this time! How are you going to adjust this new quarter to get back on track with your goals? Have you clearly defined what matter the most in your life and what you are trying to accomplish? Are you happy with the income you are earning? Do people in your industry know who you are and are people you want to be hero to know your vision and are mobilised to help you lead your movement? If you want a more personalised guidance, book a strategic call with me. I look forward to serving you. Want to recommend guests to this show or nominate yourself?